It’s complicated. Yes, this is definitely a lawyer answer, but it’s also the truth. Complications like this are a good reason to make sure you are represented by a personal injury lawyer who also understands divorce laws. Otherwise, you could end up having multiple attorneys trying to communicate back and forth about your case in order to protect your rights. At the Law Offices of Todd K. Mohink, P.A., we streamline these issues through a comprehensive approach to representation. Here are some of the things that go into determining whether your personal injury settlement is marital property. So the question is whether personal injury funds are considered “income” earned during the marriage. In a court case, Murray v. Murray, the Maryland Special Appeals Court was confronted with just this question. An attorney was suing her former law firm in an employment dispute. She and her husband filed for divorce, and the settlement was received after separation, but prior to the divorce being finalized. As you can imagine, the lawyer wanted to keep the funds from the settlement, but the spouse wanted a share. Here’s a very brief summary of how the court decided. Any portion of a settlement that is for lost income or wages will be split per equitable distribution rules, just like any other income. Any financial losses incurred, such as medical bills, were incurred by both spouses, thus compensation for medical expenses are subject to equitable distribution. If a settlement includes payment for loss of consortium (loss of physical and emotional love and affection), then this part is shared between the couples as well. Pain and suffering is inherently personal, and these awards are not subject to equitable distribution, except in limited and rare situations. 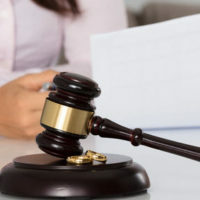 If the injury or event that gave rise to your injury claim occurred before your marriage, then it is generally not a marital asset unless you were to agree to make it part of the marital estate, such as through a prenup agreement or by commingling the funds. Likewise, if the injury was suffered by a loved one (e.g. an aging parent or sibling), and you are receiving the funds through a wrongful death or survival action, then it is generally not going to be part of your marital estate either. Of course, like everything in the law, there are bold exceptions. If you are expecting a large injury award but are in the middle of a divorce, or if you’ve suffered an injury but anticipate divorce, call a lawyer who understands the nuances of how these two areas of law interlock and work together. Call the Law Offices of Todd K. Mohink, P.A. in Maryland for help today.